Last week, I got to BoardSource at 8 am just so I could hear Marnie Webb and Rebecca Masisak, CO-CEOs of TechSoup Global share their lessons learned in developing, weaving, and stewarding two very different types of networks. The presentation is here. The first network is TechSoup Global that was launched over 5 years ago, initially to distribute Microsoft products to nonprofits at reduced cost around the world. (You can review the slide deck to get the details of its growth in terms of global partners and software products). This first network was more formalized because of the risks involved in distributing software and also because of the funding investment. It required more structure, planning because of the risk associated with failure. The second network, Netsquared, in contrast was more loosely controlled with a lower risk in failure. As Marnie Webb put it, to participate in this network, you simply has to raise your hand and be willing to meet people in a bar to talk about social media and social change. They had vastly different ways in which they approached partnering. In the first, they need trusted NGO structures, trusted brand outreach, language and time zone support, and localization of programming. When they first started, since they didn’t have an extensive presence in these various countries, they wanted to be very careful that they were not the perceived as imposing “American” ways. They found they had to build relationships, face-to-face, and on the ground. One tidbit that Rebbecca shared is that they didn’t demand or require that their partners use their logo (although a simple text acknowledgment was included instead.) TechSoup has done an amazing job of partnering with local organizations throughout the world, and customizing the partnership to both minimize the risk and meet local needs. Rebbecca shared some lessons learned by “retro-fitting” theory to their actual practice using this framework. 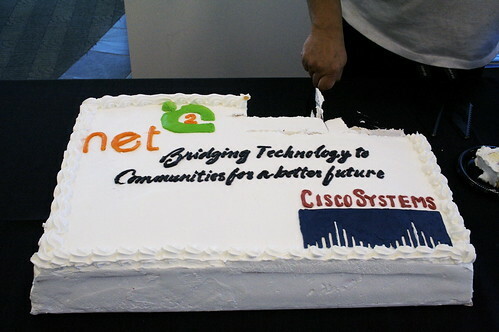 -Could have provided the Netsquared community with more tools to do their work like listserves, web sites, etc. While this might have fueled the organic growth, they are unable to track some of the impact. -TechSoup Global could have leveraged its resources in other programs to help with outreach. While Marnie didn’t say this, sounds like a silo issue or maybe just a matter of one database not integrating with another? -They were not prepared for their success. Not that they thought they would fail, but just didn’t have foundation to scale. I was struck by Marnie’s comments on this and ask her to explain them on a FLIP video interview. She also blogged a few thoughts. As I listened to Rebecca describe our efforts and I listened to the questions and comments from the attendees it dawned me that one of the lessons we could draw from these two very different networks was that we weren’t prepared enough for success. We were so deep in figuring things out, in trying to work through the current reality that we didn’t really think about what happened if things worked — if we ended up delivering unexpected value to our partners or our community or if we started attracting other networks. In fact, both of those things happened. So what could have done to be better prepared? We could have thought through open nodes — the places where other services could be delivered, we could have done more to define a sort of maturity model for partnership and we could have been quicker to recognize the necessary evolution of our systems and structures. This is hindsight, of course, but it’s a good lesson, I think, to not just talk through managing risks and the immediate operational needs but to also think through the implication of success. The governance issue is very interesting. TechSoup Global has a board, but they also have partners with advisory boards as well. As Marnie shared, they anticipated “Smushing” them together in a way that makes sense. How they’re going to do that? They’re going to bring everyone together and ask them. Marnie shares that in this video. I am reminded of the quote I heard from Meg Wheatly, if you’re not making it up as you go along, then you’re out of touch with reality. TechSoup Global might be making it up as they go along, but they’re not out of touch with reality and certainly they are blazing trails for many of us in the nonprofit sector.